Nintendo sometimes have very strange ideas about how to create things. The NES joypad had good quality but was so very square that your hands started to hurt after a while. The SNES joypad had some buttons added and the corners were made round not to hurt the hands. The N64 joypad had some buttons added, an analogue stick and this time ergonomically designed to fit your hands. All 3 of them. Sadly humans have only 2 and no, I did not use my foot. As more buttons is almost always welcome on a joypad, the games developers utilize very happily the whole controller which was not possible to control if you did not move your hand which was very annoying. Other than that, it was an ok joypad. As this piece of hardware was supposed to be even more powerful than the Playstation I was really interested in what Nintendo could put out once again. 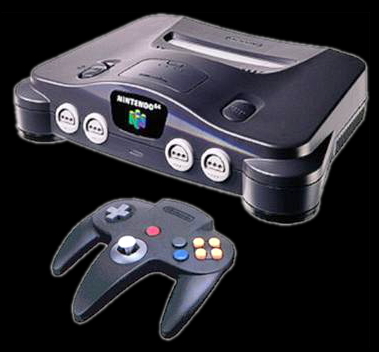 Super Mario 64 which was bundled with the console, was truly fantastic. I loved running around exploring the already known universe of Super Mario in the all new 3D graphics. They had made a great job with the conversion from 2D to 3D and it had wonderful gameplay. Rare took the concept of Super Mario gameplay even a bit further with it's "Banjo Kazooie". They eliminated some of the annoying aspects and made an even more interesting world to explore. The environment was beautiful and fairytale like. The music really added to the atmosphere and is some of the best I have ever heard. The audio in this game still impresses me. If you hear a song when you run around on land and then jump into the water, the same song continues but the sounds in the song gently fades to new sounds more suitable for that environment.